Larry Mickial Rosnuk, born Welland, Ontario, Canada in 1947, started painting at Kingston in 1971 shortly before he graduated from Queen’s University with a B. Sc. Engineering in Geophysics. Berlin Wall 1980, mixed media on paper 24x36"
The Artist is best known internationally for his parallel art action in West Berlin in 1982 during Canada’s largest, at the time, art event “ O KANADA “ . 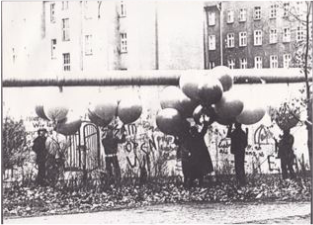 Canadian Art was solicited from artists across Canada on a “ Gestetner “ master and these prints were printed in West Berlin and distributed to the people in West Berlin and some were ballooned over the Berlin Wall to the people in East Berlin. 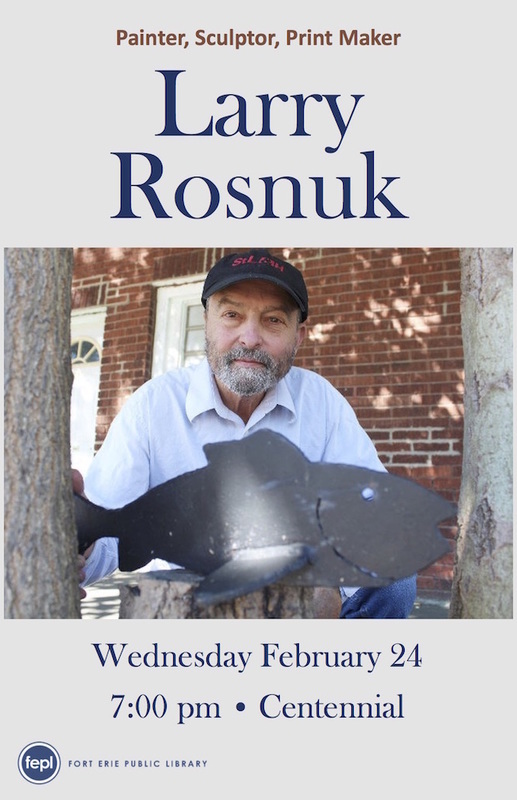 In 1986 the Artist graduated from Niagara College with a welder/fitter diploma and gained industrial experience at the Port Weller Dry Docks and worked one winter on the winter fleet in Port Colborne. 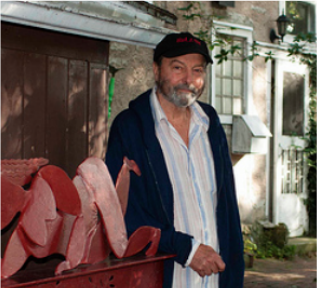 Immediately the Artist began producing steel sculpture and his “ A Canadian Landscape Blackened by Acid Rain, 1986” was exhibited in the invitational “ Niagara Now- 34 Points of View” at Rodman Hall in St. Catharines, Ont. 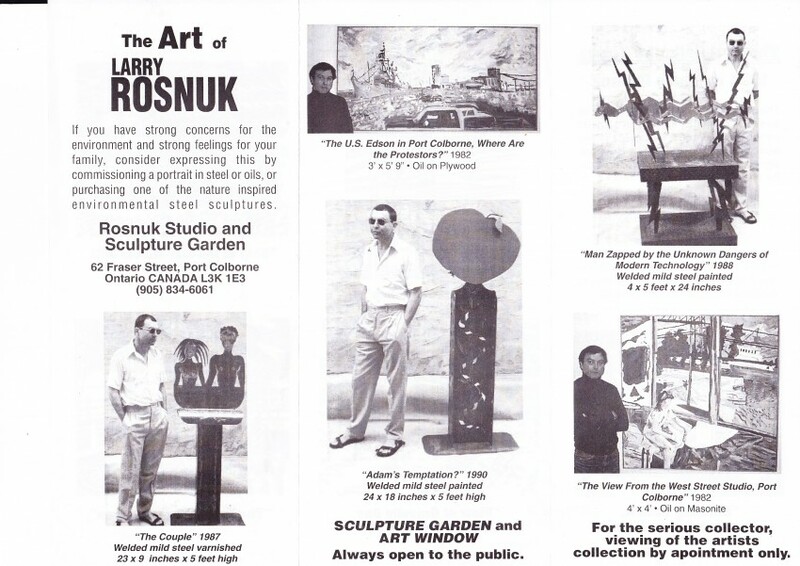 In 1986 and “ Look 88 “ a juried show at the Sarnia Public Art Gallery, Sarnia Ont. 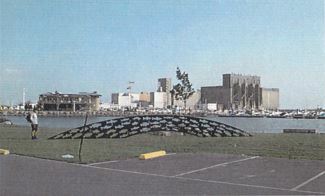 in 1988. In 1991 the Artist, because of the threat to Canadian Culture due to the Canada/US Free Trade Agreement, initiated a national project “ Canadian Content” encouraging Canadian Artists to form a Cultural Barrier along the Canada/US border. 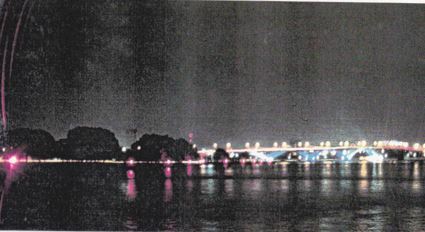 This resulted in the Protest Art Piece “ Rupture “ the lighting of 40 red emergency flares on the Peace Bridge and along the north shore of the Niagara River by Larry Rosnuk. August 2, 1991 between 9:20-9:40 p.m. 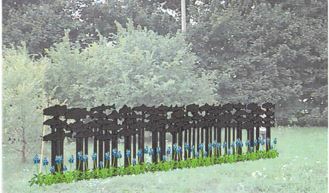 The major focus now for the Artist is to produce public art, in 1997 the Artist along with the East Village Ratepayers Association and in collaboration with a number of metal fabricating businesses in Port Colborne applied for an Ontario Arts Council grant to produce two metal sculptures, to raise the self-esteem of children in the lower east side of Port Colborne. 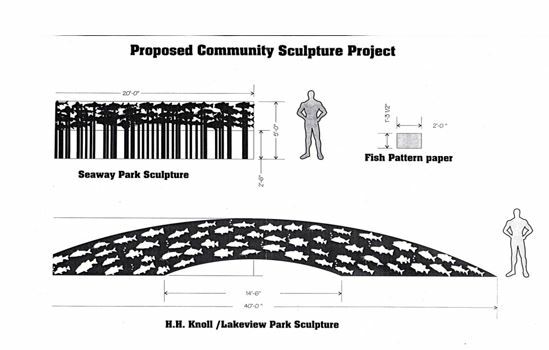 Using the input of the children and using the positive and negative aspects of the steel cut outs, a characteristic of many of the Artist’s ideas, it would have resulted in two sculptures for the City of Port Colborne, one for Seaway Park and one for H.H.Knoll. 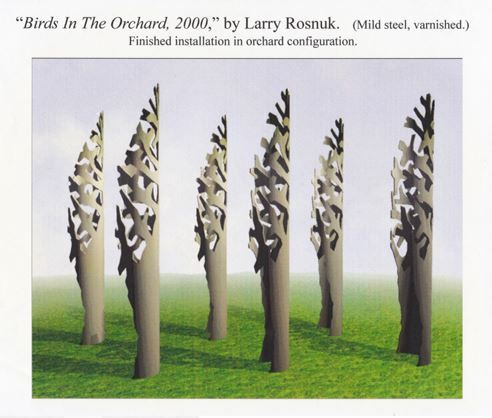 In 2000 “ Birds in The Orchard “ was proposed for the courtyard outdoor site for the Niagara College site –responsive Open Art Competition. 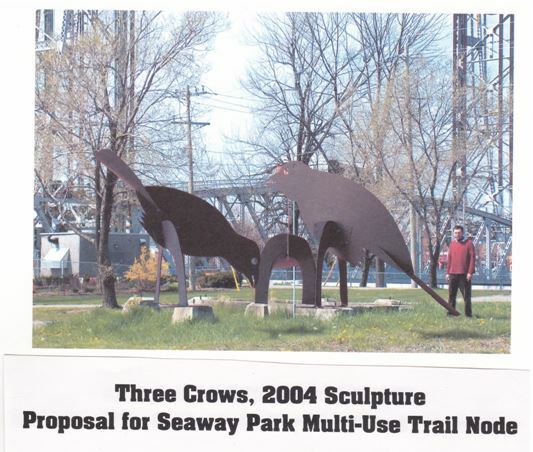 In 2004 the Artist conceived the sculpture “ Three Crows “ for the Seaway Park Multi-use Node in Port Colborne, as part of his ongoing portfolio of public art ideas, As always, the Artist considers his public pieces to be “ Photo Ops “ thereby enhancing the experience of visitors. In 2004 when the old fire hall in downtown Port Colborne became surplus the Artist approached City Hall with the idea of turning the building into an Art Center and Gallery with a solarium and washrooms. The Center would have been the first “ off grid diurnal “ public building, functioning only when the sun was out and using the thermal mass of the old building encapsulating the old structure in concrete and glass. 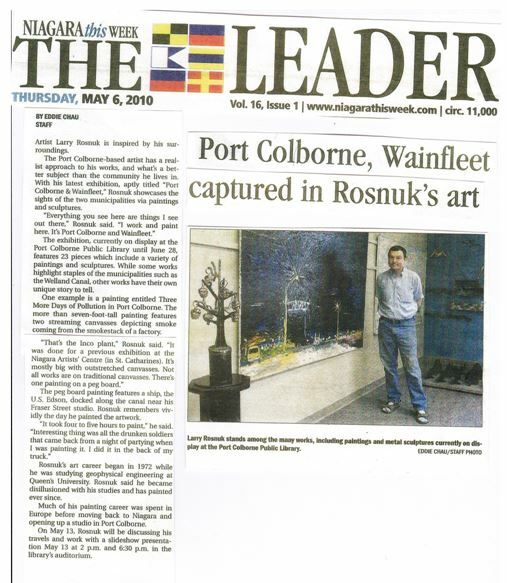 The last solo art exhibition for the Artist was in May 2010 at the Port Colborne Library Atrium Gallery, it was a retrospective of 23 pieces from the Artist’s collection of paintings, prints, sculpture and works on paper inspired by Port Colborne and Wainfleet during the period 1975 to 2010. 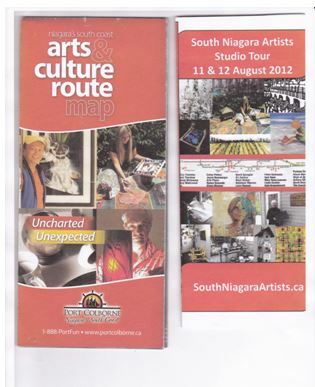 The Larry Rosnuk Studio and Sculpture Garden is now a permanent site in the City of Port Colborne’s cultural sector and is one of the sites featured in The Niagara’s South Coast Arts & Culture Route Map. 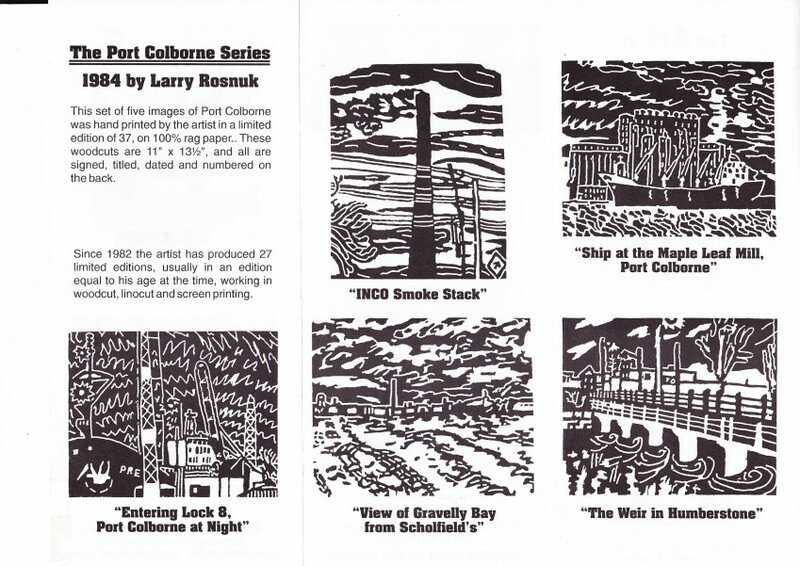 Because of the publication Larry Rosnuk founded the “ South Niagara Artists “ a network of over 25 artists and 23 studios that now have an annual studio tour each August heading into it’s third year.